On August 9, 2014, Michael Brown, an unarmed Black teenager, was shot multiple times and killed by Darren Wilson, a White police officer, in Ferguson, Missouri. This tragic act provoked grief and outrage in Ferguson and across the country. We mourned the loss of an innocent young man, taken before his time, and recognized that his killing was the latest in a long and rapidly growing succession of cases involving police use of lethal force against unarmed people of color. What must change so that not one more person of color is unjustifiably and indefensibly killed by the police? Local law enforcement units too often treat low-income neighborhoods populated by people of color — communities where people strive to live, learn, work, play, and pray in peace and harmony — as if they are enemy territory. Youth of color who should be growing up in supportive, affirming environments are instead presumed to be criminals and relentlessly subjected to aggressive police tactics that result in unnecessary fear, arrests, injuries, and deaths. This approach prevents police from being seen as trusted community partners, undermining neighborhood safety when coordinated efforts are most needed. The militarization of police departments further erodes the trust that should exist between residents and the police who serve them. The proliferation of machine guns, armored vehicles and aircraft, and camouflage in local law enforcement units does not help police-community relations, the future of our cities, or our country. To move forward, the country must also acknowledge and counter the effects of systemic racial bias, which impairs the perceptions, judgment, and behavior of too many of our law enforcement personnel and obstructs the ability of our police departments and criminal justice institutions to protect and serve all communities in a fair and just manner. 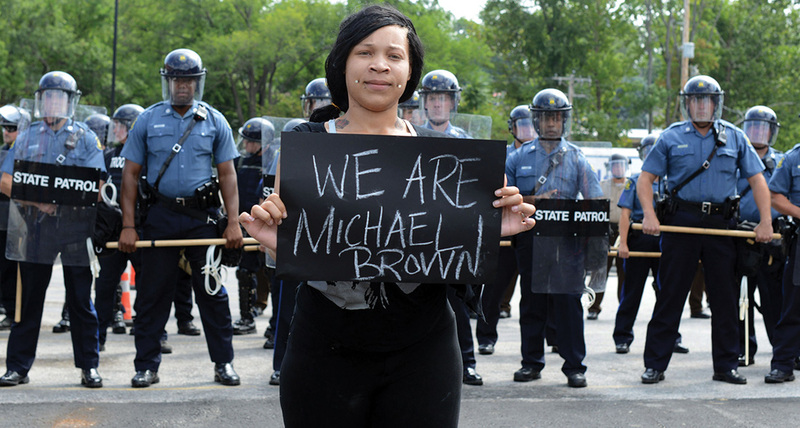 In the aftermath of Michael Brown's death, PolicyLink, the Center for Global Policy Solutions, and over 1,400 social justice leaders, congressional members, faith leaders, artists, and activists signed an open letter to President Obama, urging federal action through the Justice Department to improve police-community relations through seven principles. Soon after the letter was issued, the Justice Department launched the National Initiative for Building Community Trust and Justice. Funded with a three-year, $4.75 million federal grant, the initiative invests in training, evidence-based strategies, policy development, and research to combat distrust and hostility between law enforcement and the communities they serve. The initiative brings together a consortium of national law enforcement experts, including the John Jay College of Criminal Justice, Yale Law School, the Center for Policing Equity at UCLA, and the Urban Institute. Several weeks later, the Department of Justice completed its investigation of the Ferguson Police Department, uncovering deep-seated injustice and racism in nearly every facet of the department's practices. Soon after the report's release, a Ferguson municipal judge and several Ferguson police officers — including Police Chief Thomas Jackson — resigned or were fired. At the same time, the President's Task Force on 21st Century Policing released a robust report, complete with thoughtful and comprehensive recommendations and action steps to help overhaul policing practices in a way that benefits communities.